If you meditate or pay attention to your dreams at the time of the dark of the Moon, the messages and energies of the lunar cycle will often come to you through your intuition and inner guidance. This is especially true for this lunar cycle in that the New Moon and Sun are next to Neptune (the planet of dreams and spiritual guidance) at the time of the New Moon, March 6th (11:04 am EST). 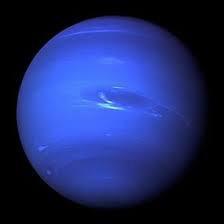 Last night, I had a powerful Neptunian dream. In the dream, I was being taken through a spiritual initiation process. I was aware that this was both the process that we go through at the time of death but also in opening up more fully spiritually. I was taken through a number of phases or initiations. The initial ones were focused on releasing any identification or attachment to ego and on letting go of mediating or interpreting life experiences through the mind. I realized as I went through these phases of the process that my mind was trying to be in control and attempting to figure things out, but that this only led to distortion. I could only see clearly and understand what was going on around me if I saw it through the eyes of the soul. This meant trusting my intuition and seeing from the soul self rather than filtering life through my personality or thoughts and beliefs. Interestly, Mercury went retrograde yesterday (on March 5th) and will be retrograde until March 28th. This awareness is the profound message of Mercury retrograde. It is about letting go of your analytical ways of viewing reality and listening to your intuition and letting your right brain guide you rather than your left brain. Mercury is currently journeying through the sign of Pisces, which is also about listening to the voice of Spirit within and being guided by wisdom of the soul. The final phase in my dream and in the initiation journey was to enter the chamber of lost souls. I knew that this part of the process was very dangerous, and that many initiates had lost their way in this chamber and either died or went insane. Determined, I entered into the chamber and was then immediately plunged into a black void. I could see nothing and had no solid ground beneath me. It was as if I was floating in the darkness of space. All around me, I could feel and hear phantoms or spirits of those who had died in anguish or pain, who had unresolved issues or trauma and were in eternal torment. I couldn’t see the spirits, but I felt their energy and was bombarded by waves of pain emanating from them and was surrounded with their cries of pain, sorrow, terror and despair. The feelings and sounds of their torment were overwhelming. I felt as if I was a fragile sea wall being bombarded by the wind and waves of a hurricane. I tried to hold steady but knew that my strength and sanity were ebbing. I felt as if I was on the edge of a precipice about to fall into the void. The pain and anguish kept washing over me, and I knew that it would soon drive me into madness. I realized that it was futile to try to resist the pain. Instead, I needed to open to it and to know that my own pain and unresolved wounds were echoed in the cries of despair around me. We all hold the pain and suffering of humanity. There is no separation. Yet, I also knew that to merge with the anguish was to die and then live on as a spirit in perpetual suffering. This was hell. I dropped into my heart and opened to the suffering of these lost spirits, but I also knew that my empathy and compassion would only be overwhelmed by the pain around me. I dove deeper into my heart and opened myself to the love of the Cosmos, to the eternal grace and compassion that is the Source of all that is. I let that love flow in me and emanate out of me into the blackness and anguish. The energy of that unconditional, eternal love met and held the waves of pain. It did not dissolve them. The energy of that love held all of it and was stronger and deeper than the pain. It was only by staying in that love of the Cosmos that I could find a place of calm in the storm surrounding me. I held to that place of stillness and continued to focus on and open to that profound energy of love. And I felt myself merging with that and being in and with that oneness. As I woke up — both literally and spiritually, in both the initiation process and also from the dream — the message that resonated within me was that we are meant to see with the eyes of the soul and live from the heart of the cosmos. This is the message of this New Moon as Neptune merges with the New Moon and Sun in the sign of Pisces and in the stars of Aquarius, sending the living waters of wisdom to us from the sky. This New Moon is guiding us to dissolve, to let go of our egos, to let go of our sense of separation and attachment to the mind’s effort to be in control. Jupiter is squaring the New Moon and is at the feet of Ophiuchus, the healer. It is time to heal and to hold our own wounds and the imbalances and pain in the world with compassion. We are not separate from each other. We all hold pain. We each are both light and shadow. As we let ourselves see with the eyes of our souls, we see our own reflections in the eyes of others. As we open to that deeper spiritual awareness, we also see ourselves and each other as expressions of the creative consciousness of the cosmos. There is nothing to fear. We are all held in the infinite and ever expanding love of the Source of all that is. Like a drop of rain, we can allow ourselves to melt back into that sea of Source and be held in that eternal love. Does this mean that we are meant to split off our pain or our feelings of sadness, anger or despair? Does this mean that we are supposed to let go of our sense of self? Are we meant to transcend this human experience and bypass the wounds of this lifetime? Not at all. The message of this dream and of the New Moon is that we are meant to be with all of it — the pain, the joy, the sorrow, to honor our wounds and to see and feel the pain of others around us. The key is to not identify with the wounds or be defined by them or to become mired in or overwhelmed by them. We are meant to see and feel all of our experience and to open our hearts to the pain of others and the tumult in the world. We are meant to deepen and expand and to open to the love that is eternal and unconditional that can hold it all. Then we are whole (honoring our light and our shadow, our humanness and our eternal soul selves) and able to be channels of that love to others and to the world. Guided by the eyes of the soul self, we move into the Full Moon on March 20th (9:42 pm EDT). The Sun is now in the stars of Pisces and the Full Moon is in the wing of the Harvest Goddess, Virgo. This Full Moon is showing us how to be here on this Earth plane with the love and consciousness of the cosmos within us and flowing through us. Jupiter continues to square the Full Moon and the Sun and is guiding us to trust in the healing energy that surrounds us. 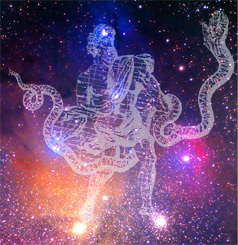 Ophiuchus is the healer who holds the integration and balance of the Sacred Masculine and Sacred Feminine and who guides us in remembering that we are from the stars but are also living in the beauty of embodiment on this planet. Our pain and our wounds are not meant to destroy us or drive us into despair or madness or to lead us into acting out in destructive ways. They are meant to allow us to hold the wholeness of the light and the dark, of joy and of sorrow, and to know that all are held in the eternal embrace of the love of the Cosmos. Only then will we heal and only then will we emanate that love and light of consciousness and of awakening. Only then will we rise up and become the beings of light and wisdom and love that we are capable of being. And only then will we turn and truly see each other through the eyes of the soul and the heart of the Cosmos and co-create a new world together that is no longer shaped by our fear, trauma, destruction and despair but is birthed through the energy of compassion, healing, creativity and love. retrograde from March 5th through March 28th.